If you are a kind of person who loves creativity but always run short of time and hands on expertise in it. 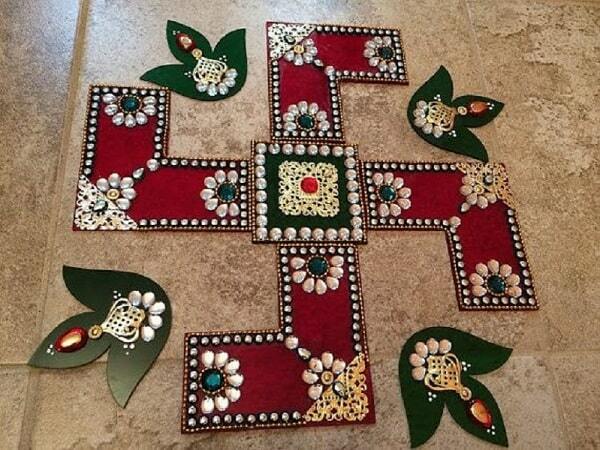 Then you must try these beautiful kundan rangoli designs. 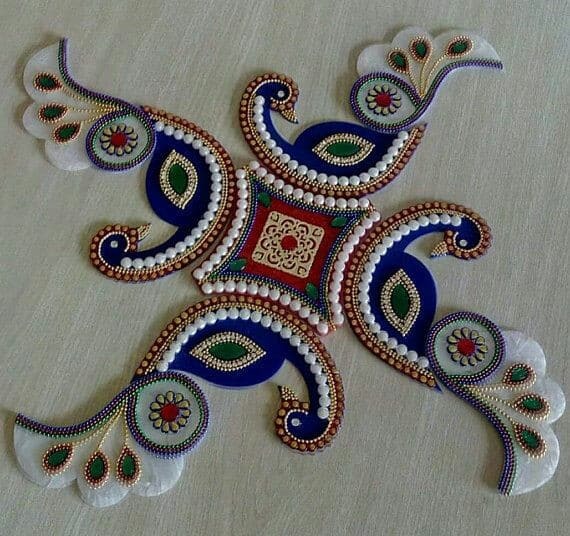 These rangolis can be easily made by using simple decorative items like pearls and sparkling gems. 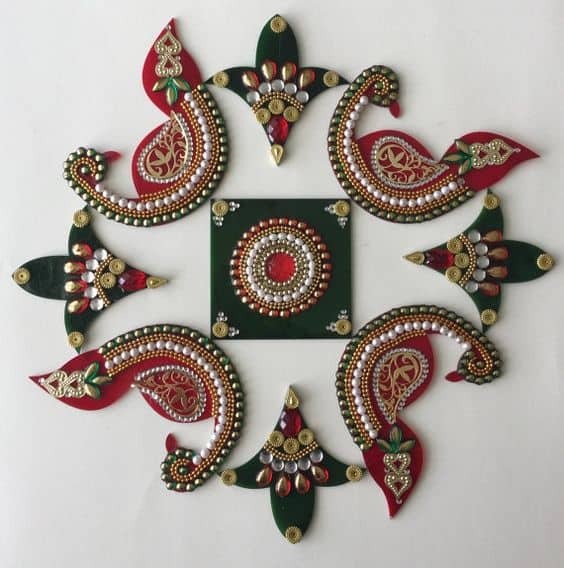 And ready-made kundan rangoli designs can also be bought and directly sticked to the floor and wall. 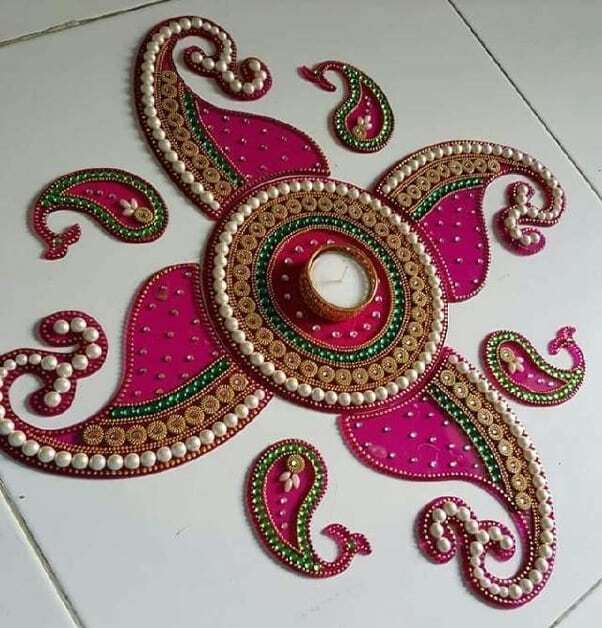 Check out these beatiful kundan rangoli from Amazon. 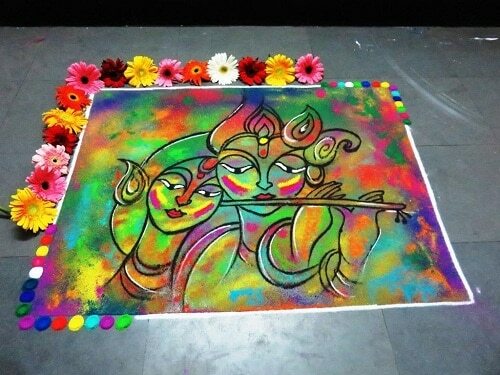 Today we have compiled a list of twelve most beautiful kundan rangoli designs. Also check our latest post on beautiful Muggulu rangoli designs. 1. 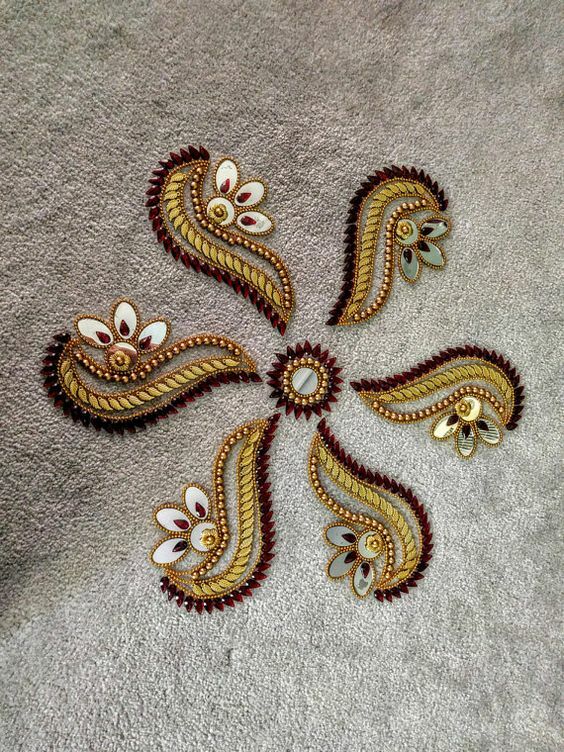 Beautiful kundan rangoli designs with peacock motifs decorated with elegant pearls. You can stick it to your wall and beautify it. 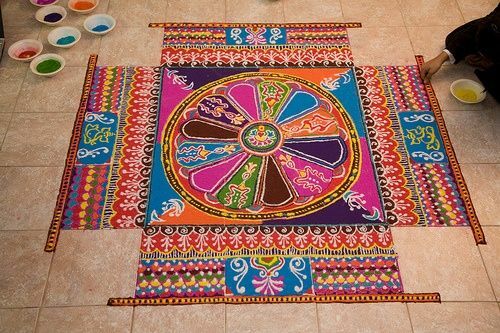 Red, yellow and green background will look great on this rangoli. 2. 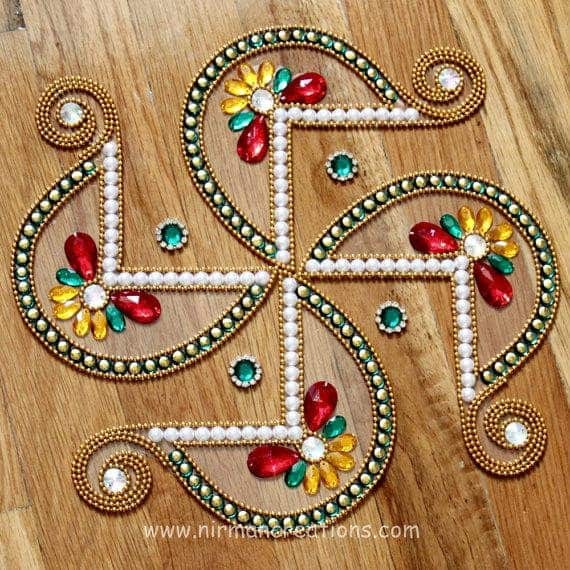 These kundan rangolis are great to decorate your pooja place. The magnificent fllower are made using paisley motifs. 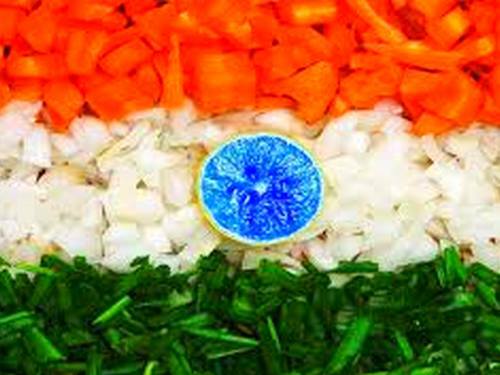 In the centre of the flower you can keep a diya. 3. One can also join different kundan rangoli designs together to make a larger one. 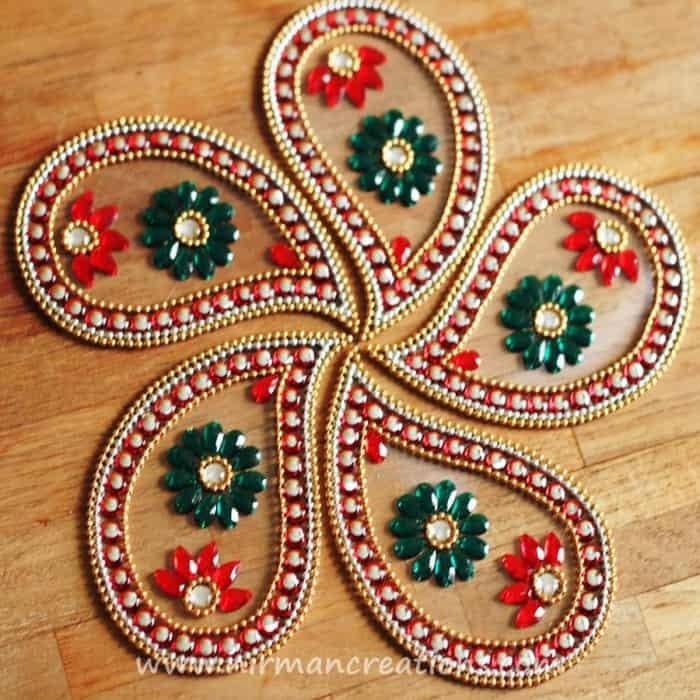 The vibrant red and green color kundan rangoli is great option for this festive season. 4. The word swastik is derived from sanskrit ‘su’ means well and ‘asti’ means being. Therefore it is a sign of good fortune and well being. 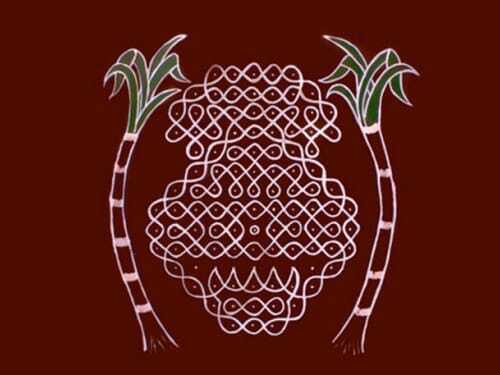 This spiritual symbol can be pasted on the pooja place for decorative purposes. 5. Diyas which are the earthen lamps plays an important part in hindu prayers and rituals. 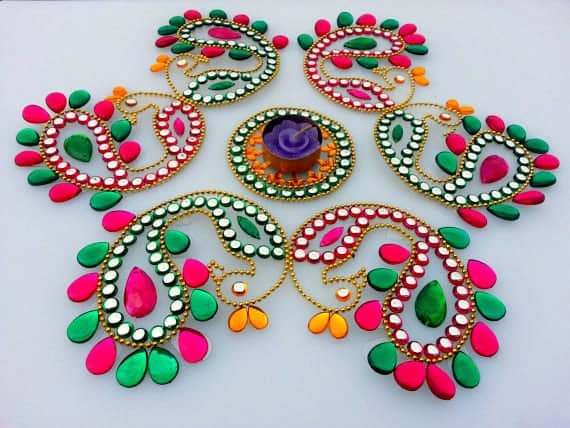 This beautiful kundan rangoli design with four diyas at the four different directions depicts enlightning of all directions and removing any sort of darkness or negativity. 6. These birds are the symbol of merriment and joy and one can use it to decorate living room walls and fill the room with positive vibes. 7. 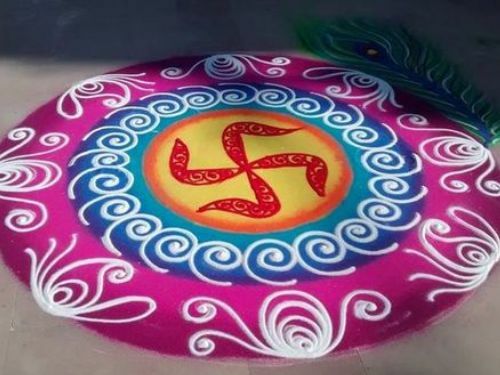 Large swastik design are perfect art piece to decorate the centre of the floor. The beautiful combination of red and green color with sparkling kundan gems makes it a great choice for festive season. 8. While picking any kundan rangoli design one should also consider the color and texture of the background where you want to stick it. The surface should be dust free and for light shade kundan designs look for darker background and for dark shade designs try lighter shade background. 9. To increase the life of your kundan rangoli always look for smoother surfaces and firmly stick them. Avoid areas that are very much prone to wear and tear. 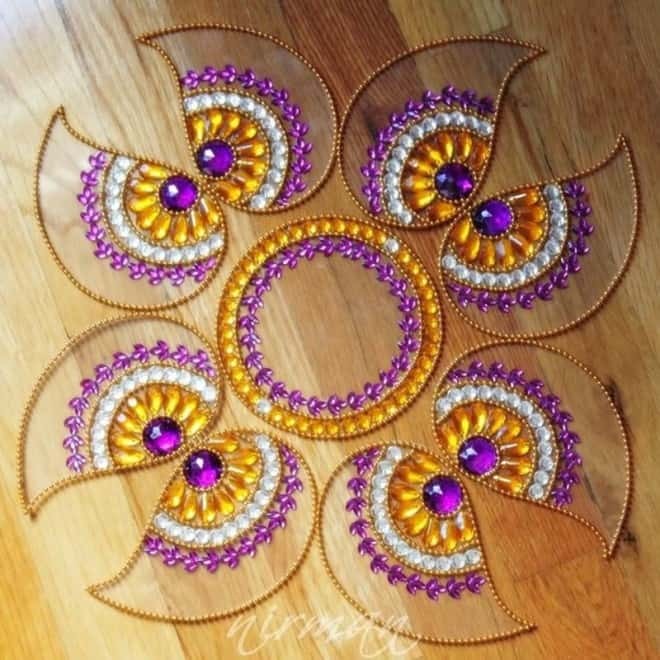 These colorful peacocks will definetly light up the floor. 10. 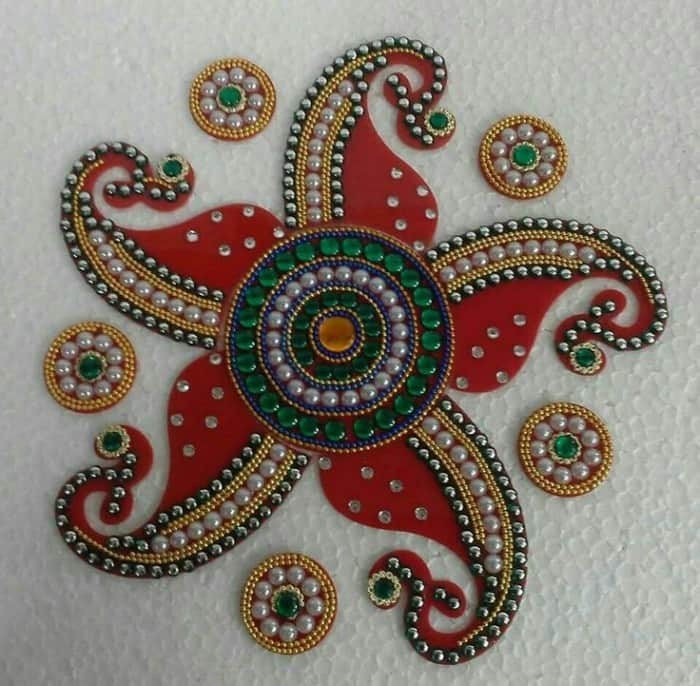 Beautiful flower motif made using kundan rangoli design on the wall. Walls are the perfect place to stick these beautiful rangolis. 11. 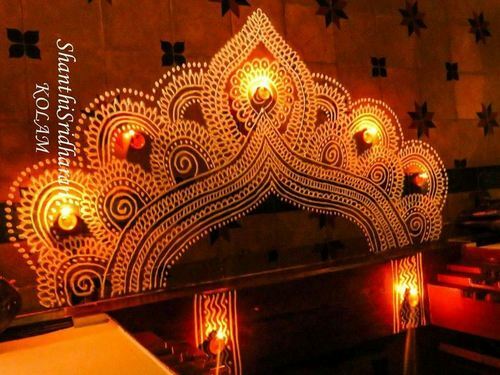 Second best place to stick these beautiful kundan rangoli designs is the worship area. As this area is also prone to less wear and tear. 12. 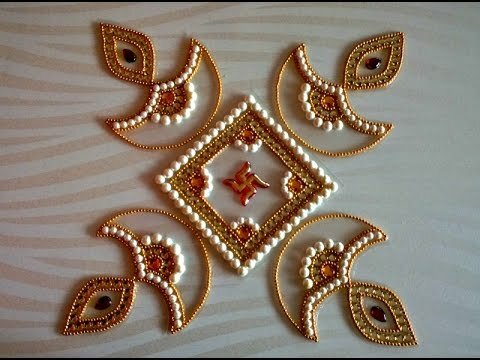 Pearls are the most popular embellishments used in the kundan rangoli designs.